Do you have the opportunity to focus on each decision you make? Chances are, you don't. All too often, our choices are rushed and relationships are strained by not thinking clearly or communicating properly. We are all responsible for our own productivity. To be a strong leader, our challenge is to find creative ways to be productive and speak with influence. 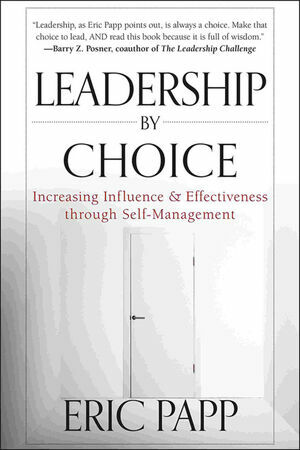 In Leadership by Choice, author Eric Papp looks at key strategies for leaders to excel not just through ability and smarts but connecting with others and establishing strong decision-making skills. The best leaders develop a system for reflecting on ideas and hold themselves accountable for their choices. Leadership by Choice provides you with applicable ideas in an entertaining manner with stories and pictures for all the areas in which you lead. ERIC PAPP is the founder and CEO of Results-Based Seminars, LLC, and a professional leadership trainer and consultant. He has delivered more than 350 professional training programs to corporate and private clients. His client list includes Nationwide Insurance, Lockheed Martin, Huntsman Corporation, and many more. He has been quoted in the New York Times, USA Today, the Dallas Morning News, and many other publications.